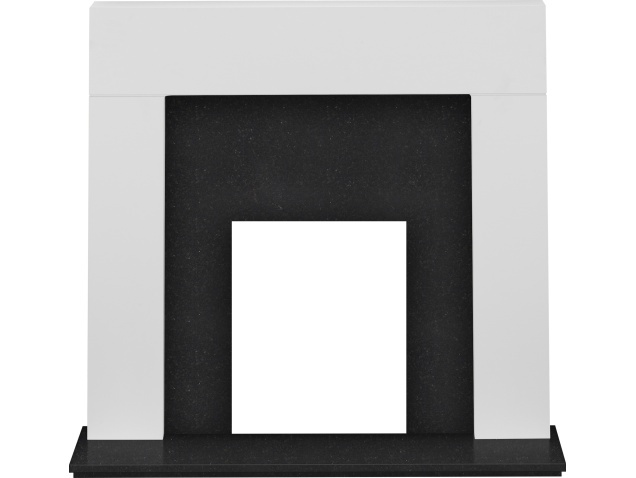 The Adam Miami fireplace surround is finished in vibrant satin white with a polished black granite back panel and hearth. This is a bright and radiant surround that can give a contemporary slant to any fireplace. Coming complete with all the Miama’s characteristic straight, clean lines and uniquely square silhouette, simply combine with your own electric or gas fire, or browse our catalogue to view our extensive range. Seen it cheaper? We’ll beat the price! We know that a fireplace makes a home, and this means you want to make sure you get the perfect one for you. So whether you’re going classic with our gorgeous marble fireplaces or keeping it modern with our stunning electric stove suites, we want to make it as easy as possible for you to achieve your dream look. Our interest free credit is available on any order over £799.00 - and there’s no limit to the number of items you can buy to make up that amount. Relax while you get the look you want at a manageable, monthly payment. Our classic credit is available on orders from just £299.00. This means there are loads of options so you’re sure to find the perfect fireplace for you. Is this back panel suitable for solid fuel or gas fires? This back panel is suitable for all types of gas and electric fires but is NOT SUITABLE for solid fuel fires. For solid fuel a back panel must be "slabbed" ( this is an addition of a light concrete back cast on to the panel ) and the granite should be cut for expansion ( the granite is cut through - but not the concrete ). How can the granite be cut or drilled? You can use an angle grinder with a diamond cutting blade suitable for granite. It can be drilled with a suitable carbide drill bit but do NOT use hammer action setting on the electric drill. It can also be drilled with a hollow diamond core drill bit. How can the granite be cleaned or polished? For general cleaning, use soft soap and water (do NOT use washing up liquid) or a solution of washing soda for difficult marks. For very sticky surfaces, use white spirit. To polish, you can use a marble polish available from most hardware stores and larger supermarkets. WD40 can be used, but it does not last long before the surface loses it's shine with this technique. How can the back panel be fastened to the wall? This product must be installed by a suitably qualified professional. It is not suitable for DIY installation. Failure to do so may result in serious or fatal injury and/or property damage. There is a gap between the back panel and surround ? The back panel is not installed correctly to accommodate a deep rebate gap in the surround. If the gap is at the sides of the panel then the surround is not suitable for a standard back panel and you should ensure the dimensions are correct. What size is the back panel? The approximate sizes are 37" wide x 37" high x 3/4" thick (940 mm x 940 mm x 20 mm). What size is the fire cut out in the back panel? Approximately 16.5" wide x 22.5" high (420 mm x 570 mm). Is this hearth suitable for solid fuel or gas fires? This hearth is suitable for all types of gas and electric fires but is NOT SUITABLE for solid fuel fires. For solid fuel a hearth must be "slabbed" ( this is an addition of a light concrete back cast on to the hearth ) and the hearth should be cut for expansion ( the hearth is cut through - but not the concrete ). How can the hearth be cleaned or polished? Are there any other granite fireplaces with a 3 inch rebate?? Yes, the Newmarket and Jackson surrounds also have a 3 inch rebate. 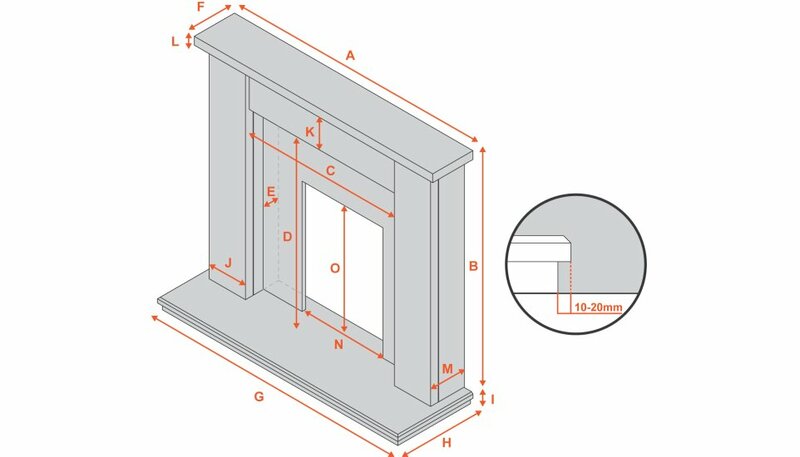 What is the rebate size on the Miami surround? The rebate size on the Miami surround has a nominal depth of 3 inches. Can’t find the answer you’re looking for?. Our experts are here to help! Call 0330 088 2060 To speak to an Expert or alternatively fill out the form below and a member of out team will get back to you. Fireplace World wants to hear from you!